Simply put, this 1955 Silver Dawn Rolls Royce is one of the finest of its kind in the world. Of the total production of 762 Silver Dawn Rolls Royces built between 1949 and 1955, the LSVJ 27 is one of the very last ever produced and is equipped with many original special options. 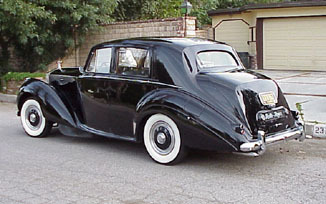 This beautiful non-restored 4-door sedan is in near-perfect conditon, having been maintained as new by authorized Rolls Royce service personal since the day it rolled off the assembly line. It drives like a dream, and has never seen a single day of bad weather. Perfect chrome, glass, running boards, accessories, etc., beautiful mirror-like, unblemished, original black paint in excellent condition, and special factory turn indicators incorporated in the leading edge of the front fenders help define the classic body lines of this Silver Dawn. The vintage vehicle runs absolutely perfect with 103,000 miles on the drivetrain. The engine, a 4.5 liter inline 6 cylinder, provides plenty of horsepower and is backed by an automatic transmission. The underhood and drivetrain has been faithfully detailed to its factory original condition. Connley hides of the original color to replace anything that may show any future wear.) The trunk and spare tire compartments are as equally detailed as the rest of the car. special -- Any car can be restored, but finding one kept in perfect condition since new is as hard as it is rare. This vintage show piece needs nothing other than a caring owner interested in either high-point Concours d'Elegance or simply owning a magnificent example of one of the best cars in the world!